From a thrilling breach to the calming sound of its breath, a whale watching tour in Newfoundland, Canada is a whale lovers dream come true! If Newfoundland and Labrador has one thing, it's water. In particular, lots and lots of salt water which is home to lots and lots of whales. 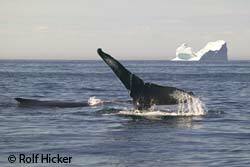 Tourists come from the world over to explore the coastal waters of Newfoundland on whale watching adventures. The summer months are the best for spotting whales in Newfoundland. The waters are full of life, and humpback, minke, fin, and pilot whales are part of the action. Feeding and playing in the rich waters, the whales will delight you with their acrobatics and astound you with their size. To get you where the whales are, there are dozens of tour operators to choose from all over the province. Humpback whales congregate here from mid-June to mid-November after their long migration from the Caribbean. These mammals grow as much as 50 feet long, and thrive on Newfoundland's capelin, mackerel, and herring. Early in the season, they are hungry. The whales haven't eaten since they left the coast of Newfoundland the previous fall. 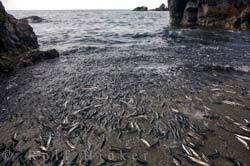 Once they've gorged themselves on oily capelin, they begin to play, some curious creatures even coming close to your boat to see what you are all about. Mothers and calves may shy away, but others appear to put on a show: There is nothing more thrilling than the sight of a 40-ton animal launching itself straight out of the water, but a breaching display is not guaranteed on every trip. Humpbacks will also slap their flippers on the surface, roll over, and show off their tail on a deep dive. Fin whales are the second-largest whale in the world, and arrive off the coast of Newfoundland by late July. These are less acrobatic, but just as exciting to see. These 80-foot animals will dwarf almost any tour boat. On a calm day, besides the peace and quiet, you'll hear the water as it sluices from their backs when they surface. They send a spout 20 feet in the air with each breath, and can swim very fast. The smaller minke whale is very shy and unpredictable. They come to feed in early June, and leave again before the other whales. Like the fin and humpback whales, the minke has no teeth. Instead, these whales feed by filtering fish through long fibrous plates of baleen that hang from the upper jaw. A 20-foot minke whale is full-grown, though these whales average about 16 feet long. The pilot whale is Newfoundland's only resident toothed whale, and the only whale to travel in a pod. 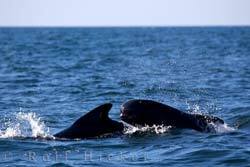 You'll see pilot whales, known as potheads to locals, from early May through October, primarily on the South and Southeast coasts. Here, pilot whales thrive on the abundance of squid. The occasional Beluga or Sperm Whale will find it's way off the coast of Newfoundland, though these are not common sights. A few lucky whale watchers will spy a Newfoundland Orca, cruising the coast for seals and salmon. These whales are seen year-round, but only rarely. They travel in family groups, hunting seals and salmon and other large fish. These predatory animals will even attack other whales such as minkes or much larger whales like the fin or humpback. Orcas are very curious, and unless they are intent on a hunt, will come quite close to a tour boat. Whales aside, Newfoundland's coast has a lot more to offer. Dolphins and porpoises are common in late summer, and sea birds such as northern gannets, Puffins, and arctic terns nest on the cliffs and islands that surround Newfoundland and Labrador. In early summer, the Northeast coast plays host to another world wonder: icebergs. These ice giants cross paths with humpback whales in June, making for a truly unforgettable sight. 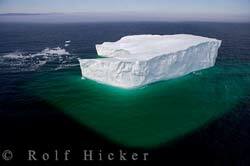 Copyright © 2000 - 2010 Rolf Hicker. Unauthorized use of any images or footage from this site is prohibited by international copyright laws.